This evening the winter storm hit the northeast. The winds swept the white snow into a frenzy to paint the windows. The fireplace glowed inside, and the smell of simmering stew filled the house. Dom and I decided to have a bottle of Chambourcin 2005. On May 3rd, 1962 Mike Fiore arrived in America. Soon after, he met the love of his life, Rose. Within a year they were married. Eventually, he settled as a technician at the Baltimore Gas & Electric Company. Rose, on the other hand, found work managing the 1st National bank in Edgewood. 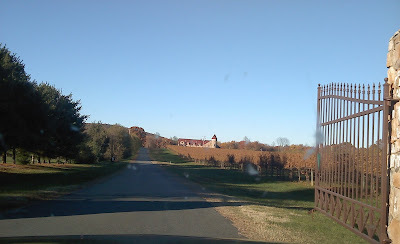 In 1975, Mike and Rose bought a small farm in Northern Harford County. Formerly a vineyard owner in Italy, he joined a Wine Growers Association to learn about French-hybrid grapes. 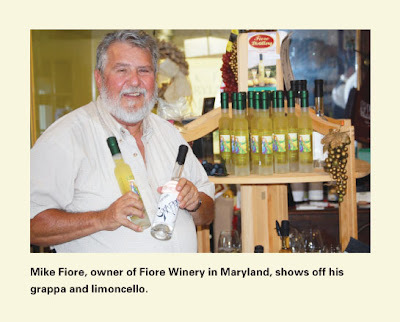 In 1986, Mike and Rose opened Fiore Winery and named the vineyards, “La Felicetta.” Mike’s enthusiasm towards the vineyard started to flourish. Over the next twenty years, the pair turned their passion into prosperity. They gradually moved from 1,500 to 35,000 gallons. Their commitment to produce a quality product has earned them hundreds of awards, including 50 international medals between 2005 and 2008. I've met Mike several times, and have beein going to his winery since the early 1990s. 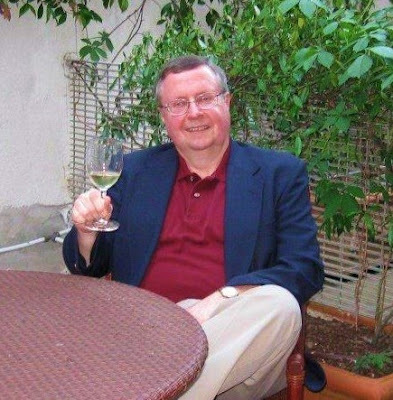 He's been a great man for MAryland wine and east coast wineries. I was excited to taste it. Proprietor's Reserve Chambourcin 2005 is estate bottled deep, dry red. According to the website, Decanter Magazine described an earlier vintage as "dark violet, resembling Cru Beaujolais in color and in crisp, fresh acidity. Youthful, with vibrant black cherry and plum aromas, then earth tones with truffle, smoke and mineral hints on the finish. Bears a striking resemblance to a young Dolcetto; excellent food wine". This is a reserve wine. Aged in oak. Bottle aged beyond that. The flavors are of dark sour cherry, with hints of vanilla and a touch of coffee. The wine got better as it sat in my glass. This was a wonderful wine. Deep, rich, and the flavor lasted for a olong, long time. Dominique served the stew, with the steam curling off off the mountains of vegetables and hunks of beef. It was rich and dark and savory. The red wine cut through all the flavors, and complimented the dish incredibly. 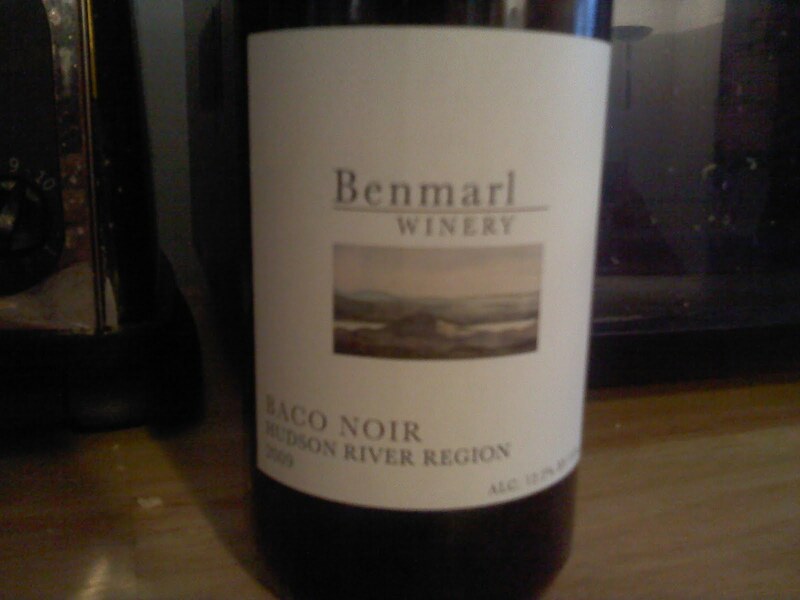 Benmarl Baco Noir is a cultish thing. You either know it and love it, or will know and you will love it. Take note. I have been hoarding Benmarl's Baco Noir for more almost a decade. I have at least a half case sitting in my cellar. It is without a doubt one of the best red wines made in the valley as well as in the state. And any one who refuses to drink hybrids is kidding themselves. This is a classy wine that is a Rhone-ish as it gets. They are missing a treat. We drank this alongside the Shaw Vineyard that I just recently reviewed, alongside the others in that post. Again, the Benmarl held its own. This newest edition is a dark cherry confection, with a hint of mocha in it, which is unusual for a Baco Noir. 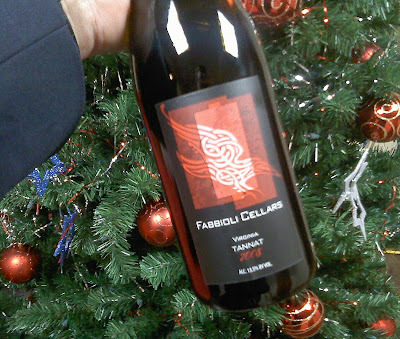 It's got lots of dark, tart cherry, and hints of vanilla, and a touch of pepper on the nose and on the tongue. As usual, this edition of the wine is an excellent version, with all the flavors you expect of a Benmarl Baco Noir. It's everything you'd expect from a nice, dark Rhone wine. Now, your job is to go out and fnd a few bottles, and start hoarding themself too, becuase they will go quickly. And deservedly so! 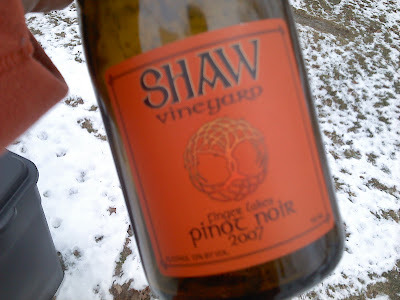 Steve Shaw is one of my favorite winemakers. Truly. Firstly, he's a world class guy. He's always friendly and direct. If you ask him his opinion, he will give it to you. But don't expect the answer you want. He won't hold back. The other reason I like him so much is that while Shaw Vineyards is still relatively new (Steve has been in the business though almost his whole life), they have struck a chord with many wine writers for one good simple reason - when Steve attempts to make a new wine, he's always trying to make the possible possible wine in the category. Not all succeed, but in one tasting, you recognize right away that this is a house that's trying t put forth quality, market ready wine. I can say without blanching, that I am never, ever afraid to plunk down my money on a Shaw wine. How many wineries can you say that about, California, East Coast, Europe, where ever? Few wineries achieve reputations like that. That's why I slapped my money down at Fox & Hound Wines in New Paltz the other day, and risked it all on a Shaw Pinot Noir Finger Lakes 2007. And boy am I happy I did. 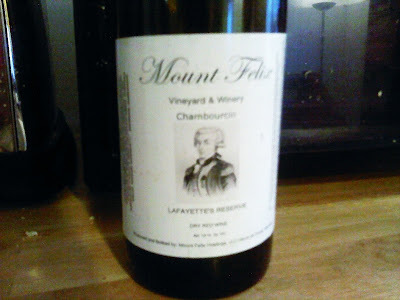 I tasted this alongside a Nuits St. Georges and a bottle of Fiddlehead Pinot Noir. 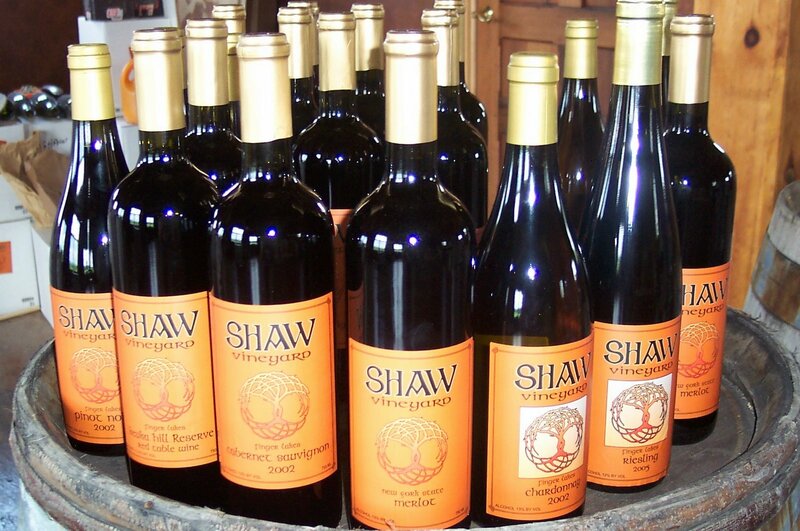 And let me tell you, the Shaw Vineyard held its own just fine! The nose was a big pop of bright cherries with a whiff of vanilla and a hint of spice? But once I to0k a sip it was all cherries. Bright and dark. What an incredible mouthfeel. Fabulous!!! Nice soft finish. Lot's of structural integrity. Classic, touch of pepper finish. Just absolutely excellent. Belongs up there with Heart & Hands, Oak Summit, and Millbrook. Excellent! I was lucky enough to be able to get my hands on some Maryland wine recently. Yeah! And luckily, one of the ones I was able to get my hands on was Mount Felix Lafayette's Reserve. Jacob Giles constructed the first structure upon Mount Felix according to a 1798 tax map. The Manor home was completed circa 1830's by agriculturist, John Mitchell. Great structures and views have inspired men and women to construct the quintessential (neo) classical villa throughout the ages. The hills of Havre De Grace crown the North Western shores of the Chesapeake Bay. From the late 1700's to the mid 1800's, the breathtaking views inspired an era of federal style villa construction for those intending their homes to also inspire "intellectual and recreational pursuits". Mount Felix is one of the few remaining villas and commands unparalleled views from its promontory that overlooks the Chesapeake Bay with magnificent, unrivaled and unspoiled vistas. Lafayette's Reserve is a fantastic, estate Chambourcin grown in their Maryland vineyard. The nose almost smelled like an old Bordeaux. Lots of dried dark cherries, tart dark raspberry, mocha and vanilla. A touch of coffee. It was a lovely medium bodied red, with a smooth finish. Not a lot of tannin, but just enough to let you know it was there. Black cherries and spices come through as promised. A wonderful, wonderful wine, and a great find! 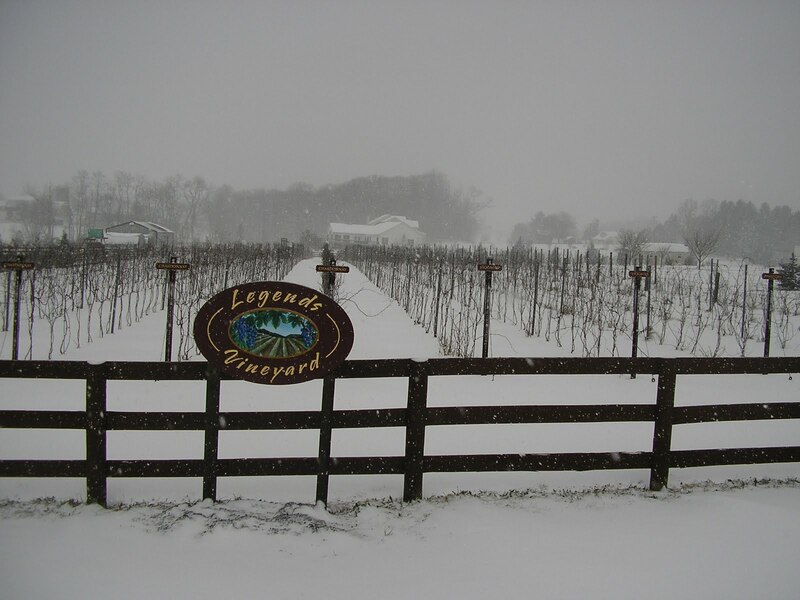 Legends Vineyard is one of the newer vineyards to open up in Harford County and is located at 521 Asbury Road in Churchville, Maryland. Over 2100 vines were planted in April 2008 including Merlot, Viognier, Pinot Gris, and Chardonnay. Ashby and Carrie Everhart are the proprietors. Their love of wine and winemaking quickly became more than a hobby. Their dreams of owning a vineyard became a reality when they found an ideal site in Harford County. 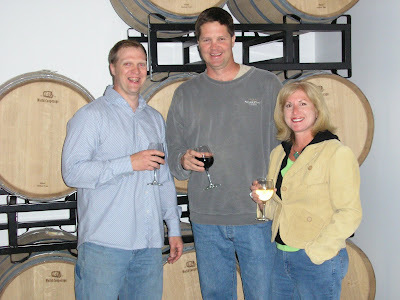 The Everharts are active members of the Maryland Wineries Association and the MGGA. Ashby is the wine maker and Carrie designs the artwork and oversees marketing and sales. Both stay abreast of new growing techniques and fermentation processes, with the goal of producing the most enjoyable wine possible. Greg O'Hare is a partner and Legends' plant consultant. He has been an integral part of the planting, growing, and caretaking of the vineyard. The winery opened on September 1, 2008. For a young winery, they collected numerous awards at the last two Maryland Governors Wine Competitions. 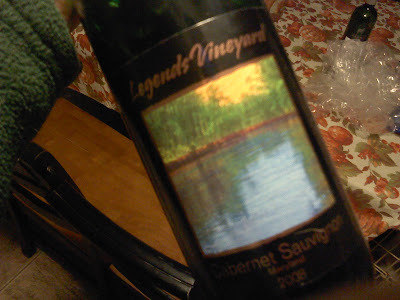 Recently, I had the opportunity to try the Legends Vineyards Cabernet Sauvignon 2008. It was aged in American and French barrels. The wine was released in March 2009. The medium-bodied red has a lovely garnet color, and starts with a nice nose full of dark raspberries, dark cherries, and a hint of red cassis. There are also hints of vanilla and the slightest touch of earth. The taste is a slightly lighter than what you'd expect, but I like it alot. It's not a California Cab, if that's what you're looking for. No, it's more a light red, a table red, but more sophisticated than that. Imagine what Burgundians would have done with Cabernet Sauvignon, for example. It's light in style, but big on flavor. It's very nice. It's got big flavors up front, nice acidity, and has a smooth finnish due to low tannins. But its got a classic Cabernet Sauvignon finnish. A very lovely drinking wine. Great with pasta, pizza, grilled meats, a nice hunk of Parmesean cheese. Something you'd be proud to pour your friends - and it's local! So, for my birthday, I went to my parents' house in Lawrenceville, NJ. My mother made a big Italian dinner, complete with a big pot of red gravy, complete with lots of meat, and loaded on top of whole wheat pasta, and served with a dollop of ricotta cheese on top. Awesome. As a birthday present, my parents had bought some local wines, very local, since Terhune Orchards is just down the road from the house, because they know I love local wine. 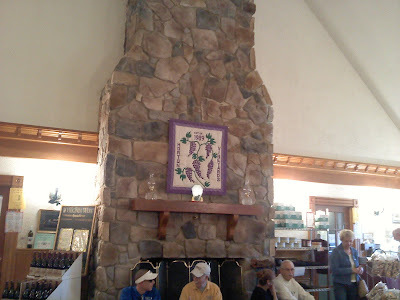 I've posted about Terhune Orchards Winery before. See the link below. 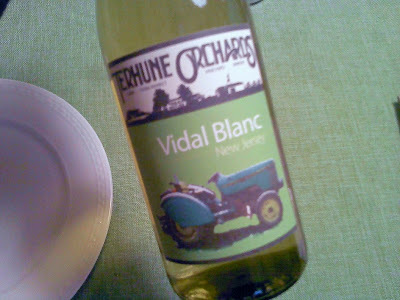 So, we started off with the Terhune Orchards Vidal Blanc New Jersey. This was a lovely, green apple flavored wine. Touch of citrus. No oak. Bright, refreshing, with great flavor and nice acidity. There was the slightest hint of sweetness. But only feint. I just sipped it for a while, and thought about how lovely it would be with any kind of cheese, salads, etc. A nice wine. 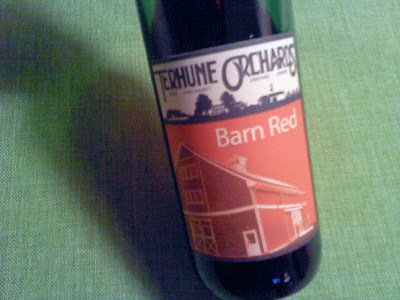 However, my favorite was the Terhune Orchards Red Barn a combination of Cabernet Sauvignon and Cabernet Franc. This was a nice, medium bodied red table wine. Lots of lovely fruit up front, especially bright cherry and zesty raspberry. It was smooth, with low tannins, and lots of flavor. A great wine with cheese, for sipping, or with pizza, pasta, chicken or pork. Also, would be wonderful with bbq in the summer. A fun, nice table red. Penns Woods Chardonnay Reserve 2007 Fantastic! So, I was in New hope, Pennsylvania yesterday morning, having breakfast with a friend, and decided to go on a little hunting expedition in the local area for local wine. 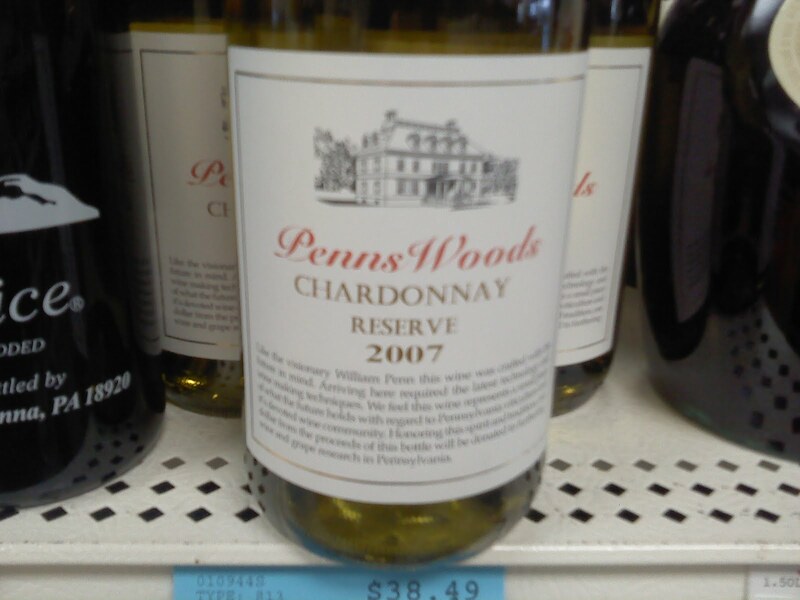 While I was in the store, I decided to pick up a bottle of Penns Woods Chardonnay Reserve 2007. 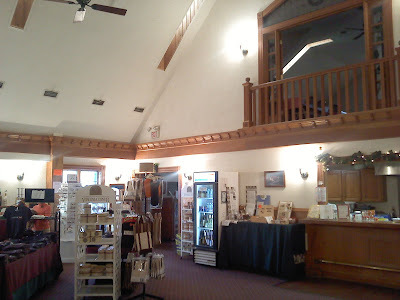 The winery is located in Chaddsford, Pennsylvania, on the Brandywine Wine Trail. Penns Woods Winery is the result of Gino Razzi's lifetime of experience in the world of wine. A respected importer and distributor of wine, Gino is an Italian immigrant from Abruzzo, in southern Italy. He settled in the Delaware County area in 1962, where he was fostered by the area's Italian-American community. Gino served four years in the United States Marines then attended college in California. After graduation, he returned to Pennsylvania to rejoin family and friends. Originally a successful a wine importer, in 1995, Gino turned his experience towards the craft of winemaking. He finished his first wine in 1997. Symposium, a Montepulciano d'Abruzzo was his first commercially released wine, and was awarded 95 points by Wine Spectator Magazine. In 2002, he began to craft wines from Pennsylvania–grown grapes. To his surprise, he found that great wines can be made in Pennsylvania. Gino decided to purchase the Smithbridge Winery, in 2004, to take advantage of its 25-year-old vines. So, the Penns Woods Winery's story is just starting. So, this is a special reserve. To start with, this chardonnay is made exclusively from the 30 year old vines of the William Penn Vineyard in Chadds Ford, PA. After a short period of skin contact, fermentation takes place in 50% new and 50% second year French oak barrels. It goes through a full malolactic fermentation, and then it rests on its yeast lees for 8 months. And they only made 150 cases. Now, I am not the first person to review this wine. 1WineDude made this #6 on the 1WineDude.com Top 10 Most Interesting Wines of 2009 - According to the Dude, "Vanilla, tropical fruit, VG acidity. Might be the best E. Coast Chard. I've EVER tasted. Period." Mighty high praise. On tof the toughest wine writers, Mark Squires, of The Wine Advocate also liked the wine, writing, "This is just lovely, a bit oaky, but crisp, and with a lingering finish. It seems very classy, surprisingly intense, if, like most of the wines here, a bit shy on mid-palate concentration. Still, I think that if Razzi has a big breakthrough here, it will be with this Chardonnay first. 88 points." Impressive. A very nice golden color. Classic Chardonnay. And the nose is bog, with green apple, clementine, and whiffs of vanilla, and some spice. I did taste the pineapple as promised. The wine was rich and complex, with tremendous mouthfeel. Great fruit up front, nice acidity, a touch of creaminess, and a beautiful long finish. I think 1WineDude was right. Instantly one of my favorite chardonnays on the east coast! And I agree with Squires, Rizzi is poised to break through with Chardonnay, establishing it as a major, cult wine. As I have said, my life is blessed. I work on wine books during the week, write about wine nights and the weekends, and make wine year round. Not a bad life. And I've gotten to meet lots of great people. Last night was another of those special moments. Last night I went with Kevin Zraly, who is promoting his newest book, The Ultimate Wine Companion, to the Sirius studios, over at Rockefeller Center, to appear on Gary Vaynerchuk's radio show. 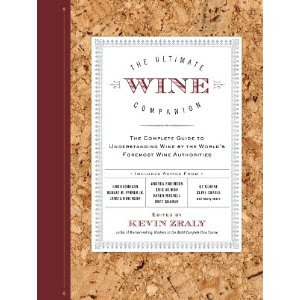 Kevin Zraly, author of one of the best-selling wine books of all time, Windows on the World Complete Wine Course, has assembled the finest writers of the last 50 years to explain everything you need to know about wine. Each one addresses the subject he or she is most famous for, including decanting, tasting, grapes, matching food and wine, winemaking, sustainable vineyards, the various wine countries and regions, terroir, and much, much more. Complete with regional vintage charts, grape charts, a glossary, and vintage labels, this book is like an entire wine library in a single volume. The authos include: Hugh Johnson o Robert M. Parker, Jr. o Jancis Robinson o Lettie Teague o Alexis Bespaloff o Neal I. Rosenthal o Oz Clarke o Gerald Asher o Joshua Wesson o Andrea Immer Robinson o Molly Chappellet o Jay McInerny o Robert Mondavi o Francis Ford Coppola o Baron Philippe de Rothschild o Joy Sterling o Michael Broadbent o Clive Coates o Kermit Lynch o Tom Stevensono Joseph Bastianich o David Lynch and Burton Anderson o Frank Prial o Matt Kramer o Karen McNiell...and of course Gary Vaynerchuk. The show is called, Wine & Web With Gary Vaynerchuk. 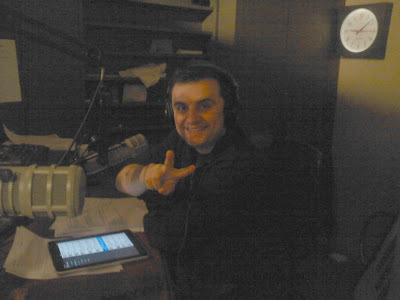 From social drinking to social networking, from tech trends to taste buds, pop the cork with Gary Vaynerchuk — America’s "Social Media Sommelier" — world-class expert in wines and master of the web brings his passion to the radio. Gary Vaynerchuk took the wine world by storm by bringing it online, reaching millions of people through web video, blogs and books. 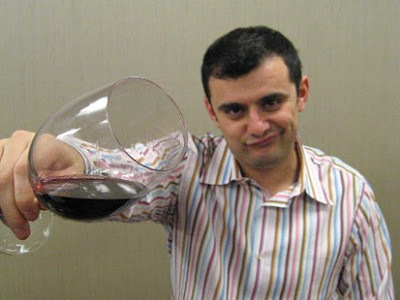 On Wine & Web with Gary Vaynerchuk, he helps you navigate the world and culture of wine, social media and more with his trademark wit, wisdom and fast-paced style. Weekly features include "Wine of the Week," on which Gary will try a new wine for the first time on the air every week, and "Site of the Week," on which he’ll riff on the latest gadgets, websites, and social media trends. It's just started in late August this year, and is on Thursdays 8 pm ET & Fridays 6 pm ET. Again, for full disclosure, I am lucky enough to count Kevin Zraly among my authors. It is a great pleasure to work with Kevin, who has a tremendous sense of humor, but who is very serious when it comes to wine. Gary Vaynerchuk is not light weight either. He is a smart, clever, passionate, and enthusiastic lover of wine, and a super salesman. But he was thrilled to have Kevin on. 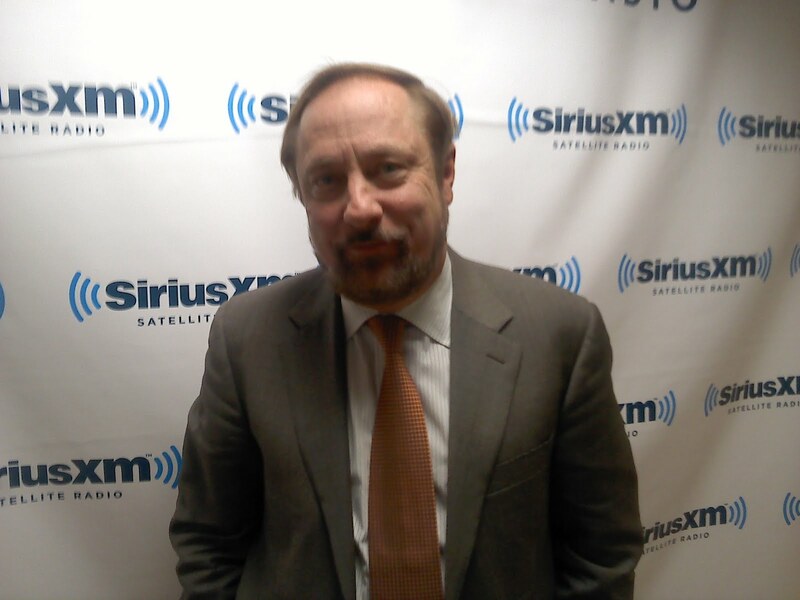 Watching and listening to them last night on Gary's Sirius radio show, was a lot of fun. Kevin was his humorous self, and Gary was gracious, effusive, and extremely nice. Anyway, a momentary shout out to Kevin and Gary. p.s. of course I didn't a picture of the two them together, go figure. Studio was dark, so the picture is a little grainy. While I was attending the New Amsterdam Farmer's Market wine festival in early December, down near South Street Seaport, I happen to taste some really nice wines at the Spring Lake Winery table. Located in Lockport, New York, the Spring Lake Winery at Varallo Vineyards is owned by the Varallo family - Dr. Nicholas, Tamre, Americo, Cristina, and Dominic. According to their website, "The land beneath our vineyards was once an ancient beach- the shore of a prehistoric Lake Ontario. This lake is now 11 miles away, but the majestic Niagara Escarpment remains, towering 250 feet above us holding the warm, moist lake air like a blanket over our vines. It’s this unique geography – where the water meets the land- that is reflected in every bottle from Varallo Vineyards." 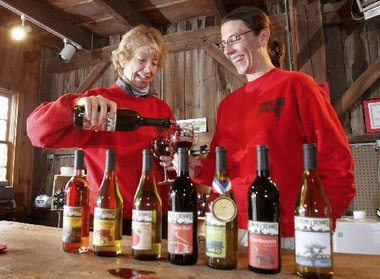 The vineyards are uniquely located in the Town of Lockport and are a part of the 78 acres that include an 8 acre spring fed lake, unique woods, and Spring Lake Winery. 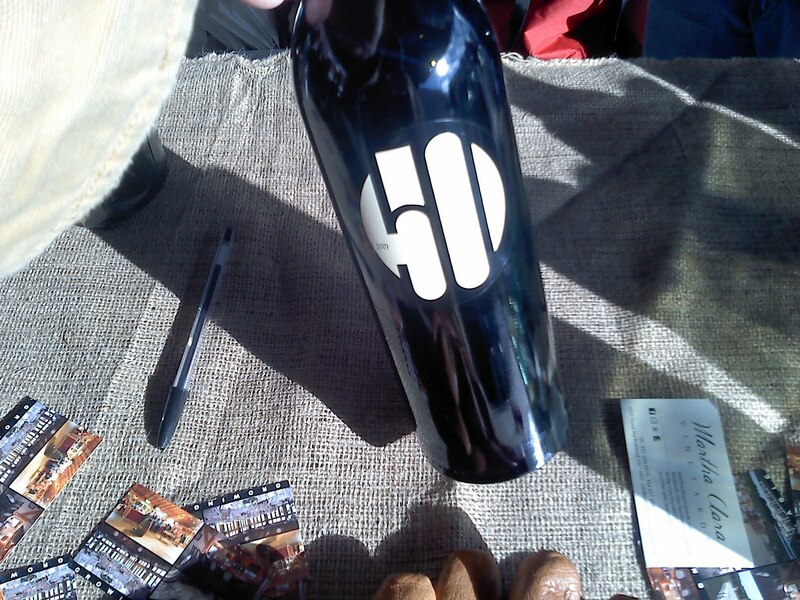 Because it was a festival type event, they had brought a limited number of wines with them. I chose to try their two reds. First I tried the Merlot. It was a medium bodied red, with a nice garnet color. It had nice cherry and vanilla aromas, and the wine had dark raspberries, maybe a touch of blackberry, and a hint of mocha or coffee. It had a nice balance of acids and tannins, and had a nice, smooth long finish. Cabernet Sauvignon was a big, deep red wine. It was a big, full-bodied wine, with lots of structure upfront. But the flavors were solid - dark cherry, red currant, again, a touch of blackberry? Nice tannins. A well balanced wine. I thought these were two very, very nice red wines. Excellent! Peconic Bay Winery on the North Fork of Long Island is going to Canada and China, joining a number of other local wineries that have been exporting to various countries over the years. The company's Nautique red and white wines, presented in a unique and eye-catching bottle and label, will initially be featured in Newfoundland, Canada as well as some upscale restaurants and hotels in Beijing, China. Palmer Vineyards was the first Long Island to export years ago, and was deeply involved in our export program focused on Canada and the United Kingdom. Several other wineries have also exported their wines to various markets, including Bedell Cellars, Duck Walk Winery, Pindar Vineyards, and Paumanok Vineyards; and Wolffer Estate winemaker Roman Roth participated in NYWGF's "Uncork New York" booth at ProWein in Germany in March. Direct sales to consumers remain the lifeblood of the New York wine industry, but as the industry expands and production grows, exploring new markets is vital. For over a decade, with funding from the federal Market Access Program, the NYWGF has conducted an export program aimed primarily at eastern Canada and the United Kingdom as the gateway to the broader European market. This year the NYWGF plans to participate at trade and consumer shows in those markets plus Belgium, Germany, and possibly Hong Kong. Finger Lakes Rieslings will be showcased in an exciting new public television series called "Vine Talk" that will be aired nationally beginning next spring and hosted by Stanley Tucci. This represents a major opportunity to spread the word about the New York wine industry to millions of people throughout the country. The 20-part series is a unique blend of education and entertainment, featuring a combination of wine experts and A-list celebrities who swirl, smell, sip and savor the wines and share their impressions. The series is built around 20 different varietal wines like Chardonnay, Cabernet Sauvignon, and Pinot Noir in conjunction with the regions well known for them--like Finger Lakes Riesling. I have been working closely with the Vine Talk produers for weeks, first by rounding up 17 Finger Lakes Rieslings, based on awards and scores, for a four-person panel of wine experts to evaluate and narrow down to six finalists for the show. The panel included a retailer, a distributor, an award-winning sommelier, and a food/wine writer from a major publication. Then, on Monday evening, the actual taping of the Finger Lakes Riesling segment took place at the WNET public broadcasting studios in Manhattan. Both a studio audience and a celebrity panel tasted the six Rieslings, and each group selected a favorite while engaging in lively discussion. You can get the basic information at http://www.vinetalk.com/. Santa Rosa, California (December 9, 2010) — Wineries Unlimited 2011, the second largest vineyard and winery trade show and conference in North America, will present several notable speakers including Jim Trezise, president of New York Wine & Grape Foundation, and Todd Haymore, Virginia secretary of Agriculture and Forestry. Produced by Vineyard & Winery Management magazine (http://www.vwm-online.com/) since 1976, the event takes place March 29-April 1, 2011 at the Greater Richmond Convention Center (http://www.richmondcenter.com/) in Richmond, Virginia. Secretary Haymore will elaborate on Governor Bob McDonnell’s vision and work to expand the domestic and global marketplaces for Virginia wines and to make Virginia the premier wine destination of the East Coast. Haymore will be the featured guest speaker following the governor’s welcoming comments at Best of the East Grand Gala on March 30. • Attendees may register for a variety of packages via http://www.wineriesunlimited.com/ or obtain general information at 866.483.0172. Early Bird Registration (20% discount on the Full Conference Option) is available through Dec 31, 2010. • Lodging for $139/night is available at preferred hotels (Hilton Garden Inn and Richmond Marriott) across from the convention center. • Travel deals via American Airlines, Delta Airlines and Hertz Car Rental are available at www.wineriesunlimited.com/directions_lodging. Wineries Unlimited offers three principal networking opportunities: Welcome Wine Reception, Keynote Speaker Luncheon, and Best of the East Grand Gala featuring gold medal winners from the 2010 Intl Eastern Wine Competition. A grazing buffet lunch takes place at carving stations throughout the trade show on March 30. I told you there was more Virginia to come. But this one wa a huge surprise. So there I was at this Holidy Party, and I'm peaking at all the wine and their labels, when I come across a bottle of Fabbioli Cellars Tannat 2008. Now, I found out, I had David Jackson to thank for this find. He'd recently been in Virginia on a wine trip, and he'd brought back a ton of fun stuff. This was certainly one of them. 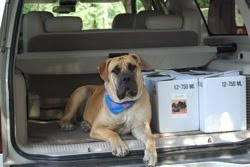 In early 2000, Colleen was driving young Sammy around to get him to settle down and stumbled into a 25 acre parcel in the southern Lucketts area, just north of Leesburg in Loudoun County. Doug Fabbioli and Colleen Berg had been seeking land for a while but were unable to find the right piece. Although this piece did not fit all the parameters of a perfect vineyard site, it would be able to grow good grapes. It also filled many other concerns and needs for our family as a home. The planting began in 2001, along with building the house. The main planting was Merlot with a little Petit Verdot for blending. Doug is a guy who has worked in Californie wineries. He was employed in the wine cellar at Buena Vista Winery in the Carneros district. Tannat is a red wine grape, historically grown in South West France in the Madiran AOC and is now one of the most prominent grapes in Uruguay, where it is considered the "national grape". It is also grown in Argentina, Australia, Brazil, Peru, and in Italy's Puglia region where it is used as a blending grape. In the US state of Virginia, there are small experimental plantings of the vine, and plantings in California have increased dramatically in the first years of the 21st Century. This was a big, powerful, rich red. A bright garnet color shine through the deep, dark night. It was a vision of deep, dark, red wine solitudde. Bold with raspberry, dark plums, and a touch of cassis, you need to get a botl of this asap! This is a wonderful wine made with care by people who know what they are doing. 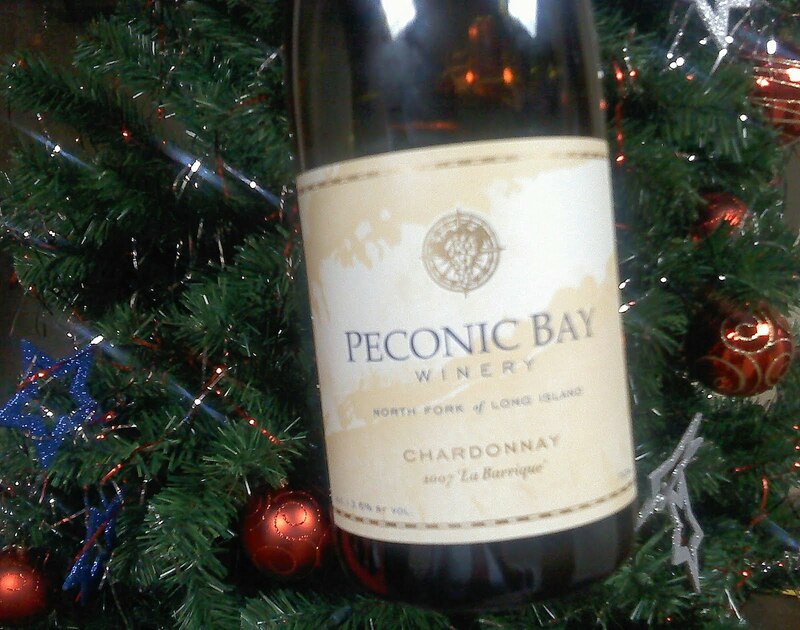 Big fan of Peconic Bay wines, and this newest one I tried was an incredible find. At a Holiday Party, on the table, was a Peconic Bay Chardonnay "La Barrique" 2007. This is a unique blend of clonal chardonnays. This is a real artisanal wine. This wine was made in the classic Burgundian fashion, in fresh new French oak, with the yeast being stirred weekly. It reminded me of a refreshing Montrachet. The mineral flavors leapt out of the glass, and the wonderful hints of citrus and a touch of tropical notes wowed me. This is my kind of chardonnay. There was a touch of creaminess, but it smoothed out the wine. Sometimes that kind of mouthfeel can ruin it for me. Too over powering. But this was an incredible white wine, with a big burst of flavor upfront, and a nice finish. Recently I admitted I am not a real chardonnay fan, but a couple of recent tastings have been turning my hand. This wine especially was a great find! A great wine, that will impress even the biggest wine snob you know. So there I was freezing my behind off at the New Amsterdam Farmers Market just this past Sunday, when I met a woman named Robin who enticed me to try some wines from Martha Clara. Arm twisting was not involed. Martha Clara is the winery owned by the famed Entenmann family. This farm is one of their pride and joys. Giles Martin is the winemaker. And he is very talented. 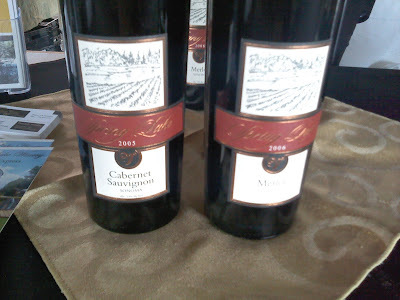 First I tried their M-erlot 2007 which had lots of medium and dark cherry, and a health touch of dark raspberry. I nice, medium-bodied wine, this was a nic smooth wine, with just enough bite on the end to let you know it was there, but not to leave you without nice fresh juice in the mouth. A very, very nice wine. Then I tried the big one - the "Five -O" Martha Clara 50 (pronounced "five-oh") is a close as you will get o California or Chile here on the east coast. This is Giles Martin's most ambitious wine at Martha Clara, and it succeeds beyond all imagaination. Mostly a Merlot and Cabernet Sauvignon and Cabernet Franc blend, with small dollops of malbec, Petite Verdot, and a touch of Syrah. Big, big deep fruit up front, with dark raspberries, dark cherries, and a stewed plums and prunes. Whiffs of vanilla, cocoa, and leather also come across. I loved it!! 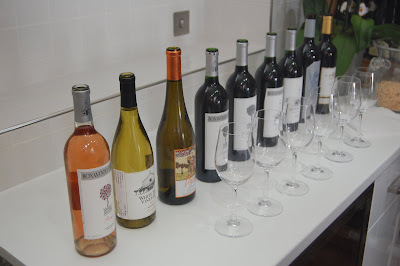 Try these wines, and taste the exciting new flavors coming from Martha Clara! And thank you Robin! 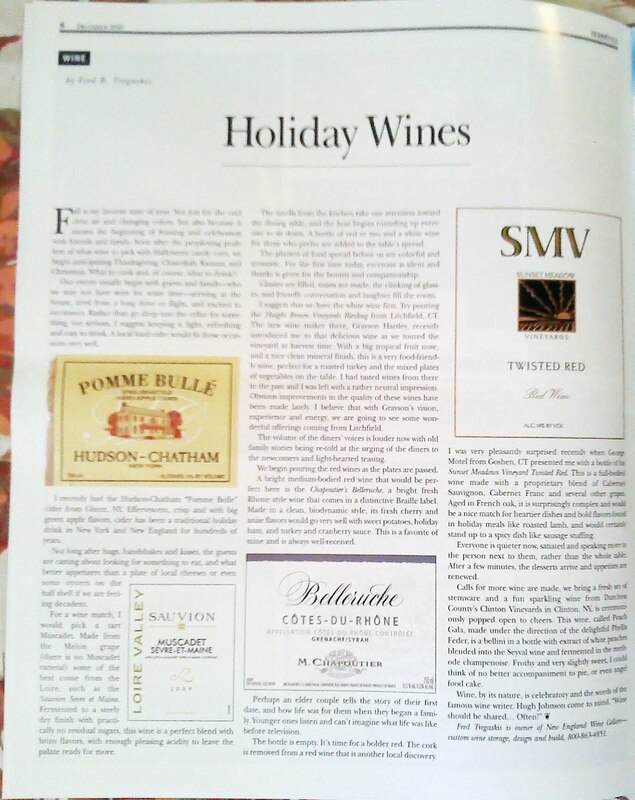 In the November 2010 of Berkshire Homestyle magazine, Fred P. Tregaski raved about a variety of wines. 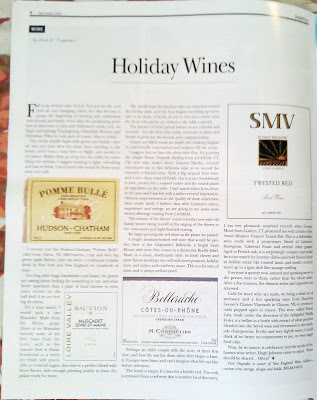 Pleasantly, he mentioned, along with French counterparts, some local wines for the holiday. Chief among the recommendations was SMV (Sunset Meadows Vineyards of Goshen, CT) Twisted Red (a blend of Cabernet Sauvignon, Cabernet Franc, and several other grapes), which he rally raved about (and with which I agree); Haight Brown Vineyards Riesling from Litchfield, CT by their new winemaker Grayson Hartley, with a big tropical fuit nose and a clean mineral finish, also very good (he also claimed Grayson would make a huge diference there over the next few years - and again, I agree); Clinton Vineyards (Clinton Corners, NY) Peach Gala, which he said was a Blini in a bottle and he found Phyllis Feder enchanting (also with which I agree), and Hudson-Chatham sparkling Pomme Bulle, a sparkling, hard farm cider (to which I have an obvious connection). A great article, and better yet, great recommendations! I want to thank Christopher Parker for sending me the following article by Michael Broadbent. 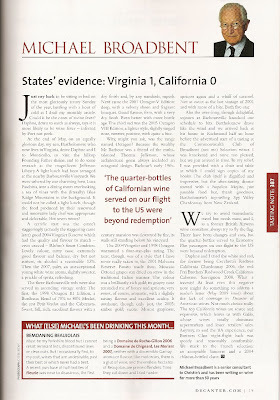 I made it a separate piece, but it certainly forwards Christopher's claims that Virginia wines are building an important reputation over in the UK. I am tardy in posting this, since he raved about Virginia wines in the August 209 issue of Decanter magazine. But it rings true today eve more loudly than when it first appeared. Because it now appears that Virginia wines are moving forward. Both Michael Broadbent and Oz Clarke have raved about recent Virginian vintages. And sales continue to clime, small, but steady. Time is on Parker's side. But this piece by Broadbent is all you need to know about the quality and growing reputation of Virginia wines. Christopher Parker is a unique individual. He is a trailblazer. He is a wine importer, but he has one very unique region - Virginia. 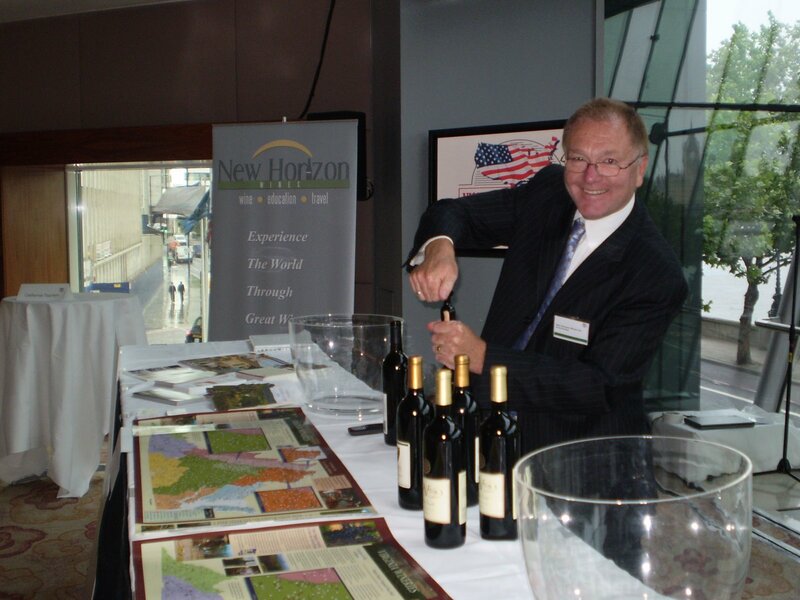 Christopher Parker is Founder & Managing Director of New Horizon Wines Ltd. He believes in Virginia wine with all his heart, and is carrying that message and passion back to his native UK, where he is spreading the word like Paul on horseback! He and I recently caught up with one another via an email exchange. Though I wish it could have been more, with the holiday season, etc. I thought it would be best to just go with what we had. Christopher has taken a small idea, and now in two-and-a-half years he has helped expand Virginia's reputation in the UK. Christopher is, in short, a visionary. Who knows where this will lead, but it can only lead to better things. It already has! 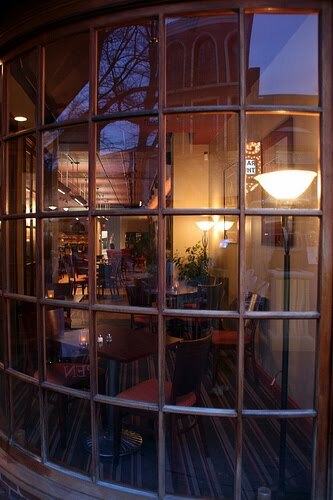 "I established my company specifically to build the international market for wines of Virginia. I am from the UK and moved to Virginia 21 years ago. I came here for business reasons and discovered wineries - who knew! !," Christopher wrote me. "I established an import company in the UK to create the channel to market for Virginia wines and have a growing network of merchants there selling Virginia wines. "My prior businesses have been in technology and software, but I have always loved wine, the art and science of winemaking, and the rich and positive lifestyle associated with it. My decision to create New Horizon Wines evolved over a few years. Having worked with winemakers in Virginia and tasted wines from many wineries over many vintages, I sensed a significant shift and upward trend in quality. It was as if, after 40 years of experimentation, trial & error, and deliberate steps taken by some wineries, everything was coming together. It was visible to me about 7 years ago. "It was at that time I started to think about the possibilities. It was not until 2006 that I seriously started to form the strategy for creating the international market for Virginia wines. I sold my software company in 2007 and New Horizon Wines was born in 2008. "I launched at the 2009 London International Wine Fair with winemakers from across the State of Virginia presenting their wines in London. This summer I organized and coordinated the wine events for the Governor McDonnell's Trade Mission, including briefing Oz Clarke to prepare for his guest appearance at the Fortnum & Mason event in London," related Christopher. Winemakers included, Barboursville Vineyards – Luca Paschina; Veramar Vineyards – Justin Bogaty, Winemaker; Veritas Winery & Vineyards - Andrew & Patricia Hodson; White Hall Vineyards – Tony & Edie Champ, Owner; Breaux Vineyards – Chris Blosser, General Manager; Corcoran Vineyards - Jim Corcoran, Winemaker; Pearmund Cellars – Chris Pearmund, Owner and Williamsburg Winery – Matthew Meyer, Winemaker. "Most recently I initiated and coordinated a visit by the Circle of Wine Writers to visit Virginia. I encouraged the support from the Virginia Wine Marketing Board and had the pleasure of working with Richard Leahy who worked with us to organize the wine tasting events." I get John Grover's wine email newsletter. He's always finding great wines. He's a real enthusiast. I recently asked him if I could reprint a recent letter because it featured Finger Lakes wines. Here it is....several good picks, and a great recipe. Well, it is starting to get colder here in the North East. And, naturally, the mind of every country boy wanders off to where? Warm comfort food, of course. This month we offer a quick and simple recipe that matches well with several wines of the Pinot Gris (Pinot Grigio) persuasion. The Pinot Gris grape produces wine in different styles around the world. In Alsace, France it is generally medium bodied with a floral bouquet and a bit of spice and fruit in the taste. In Germany, its local name is Rulander and tends to be a bit sweeter and more full bodied. And, of course from Italy, most of what we Americans see is lighter, crisp and more acidic. These differences are generated mainly by location, climate, soil and the various traditions and styles of winemaking. The Pinot Gris produced in the U.S., or more particularly Oregon and New York’s Finger Lakes is more in the Alsatian style. 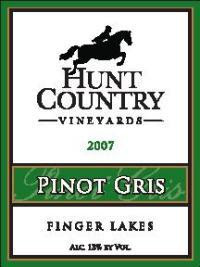 The 2008 Pinot Gris from Hunt Country Vineyards of Keuka Lake is an elegant wine with a floral nose and pronounced fruit in the mouth with the taste of white table grapes and pears. It is well balanced with little noticeable acidity. It can be bought for $16 a bottle at the winery. Other Finger Lakes producers making fine Pinot Gris include the Lakewood, Hosmer and Dr. Konstantin Frank wineries. More broadly available are the excellent Pinot Gris wines from Oregon, including those from Willamette Valley Vineyards, King Estate and A to Z wineries. The second wine highlighted is the 2009 Kris Pinot Grigio from the Della Venezie region of Northern Italy. While many of the less expensive Pinot Grigio’s from Italy can be called at best “nondescript”, this wine has a distinctive citrus nose with a rich taste of lime, melon and perhaps a hint of honey. It has a distinct acidity that creates a rich pucker of tartness that dances around the mouth. 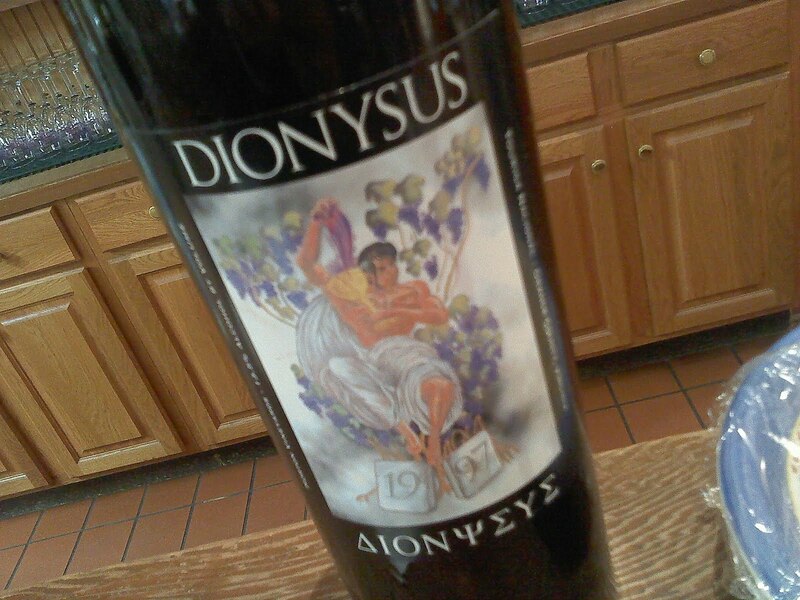 This wine is widely marketed for between $11 to $13 a bottle. Other Italian producers making excellent but reasonably affordable Pinot Grigio include Peter Zemmer and Alois Lageder. Cut rind off cheese. Combine rind, stock, garlic, parsley, and oil in a 3-quart pot, then simmer gently, partially covered, 30 minutes. Discard parsley and rind and season broth with salt. Add tortellini and simmer, partially covered, until al dente, about 10 minutes. Add spinach and simmer, uncovered, 1 minute. Divide among 4 soup plates, then shave cheese over soup to taste. I would suggest serving this soup with a nice crusty peasant bread. John Grover is a member of Mensa of Northeastern New York. He lives with his wife Sharon in the Hudson Valley of New York. I am posting this about a month late, so my apologies to the folks at Va La Vineyards, in Pennsylvania. I can't help it, but I love this winery and their wines. Exquisite stuff. And I like the way they do things. They do things right. 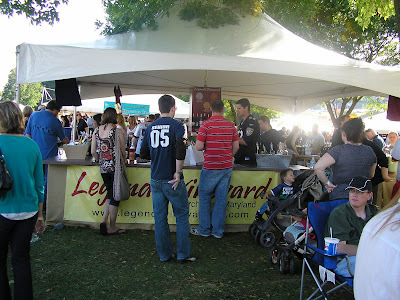 Harvest 2010 at Va La. My family and I farm a small hill of about 6.73 acres in Chester County. We produce from 500 to 700 cases annually. This vintage marked just our tenth commercial harvest which we have experience of from this site, so we do not have any deep conclusions to draw from our time here as of yet. Statistically, the summer of 2010 was the warmest in our region's history, with nearby Philadelphia recording 55 days of 90 degree temperatures. The soil of our site remained deeply dry through early October. Our methods are somewhat simplistic; all vines are dry-farmed, harvesting is done by hand, and the bins transported by lawn mower and trailer directly across the field for sorting and crushing. During the first week of September, we began harvesting the southeastern slope of our hill for the varieties that go into our single white wine. Harvest of reds began in the darker soils on September 11, and was completed on October 10. By this time we had accumulated over 4000 Growing Degree Days since March 15. In comparison, last vintage we began harvest on October 10 and completed it on November 11. Fruit Set was dangerously efficient this year, with well-packed clusters that would have suffered rot stress in a wetter year. However clusters in general were under our ten year average for this site, and berry size was reduced in almost all clones and varieties. Seed scores were excellent throughout the vineyard. Canes lignified almost fully by mid July. First leaf senescence was noted on September 24, about 17 days ahead of schedule. Incidence of rot and mildew was of course low, but bunch stem necrosis was actually higher than normal in the northeast areas of the hill. (We hypothesize this was due to declination, reduced spraying, as well as heavy reliance on low impact materials.) Berry shrivel was common place. Robin, Starling, and Yellow Jacket predation were elevated and intense, as was Brown Stink Bug presence. Lady bugs and Japanese beetles were a relative no show. Fermentations are now nearly completed in the winery. We are readying the wines for barrel. Over all, we view the quality of the 2010 harvest as having potential for us to be surpass the previous quality vintages of 05, 07, and 02. So, while I was down in Virginia, one night I had to dine alone. Ah well, it's one of the hardships of traveling for business by yourself. While I was in Charlotte, I went to the old historical district, wherein they have a lovely downtown, outdoor mall, complete with cobblestones, etc. In the mall there are many nice restaurants, but I was only there for one - Siips Wine and Champagne Bar. The bar was lovely inside, but more importantly, you could order a wide number of wines by the glass, in both 3oz and 6oz pours. And they had some Virginia wines on the list! I had some exquisite bruschetta, a plate of escargot, and a main course of braised porkchops. 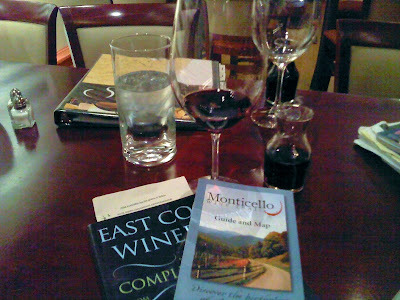 As it turned out I had a number of wines from which to choose, which was fun. But in the end, I chose the final two wines I tasted based on the winemakers themselves - Jim Law and David Pollack. Law is known as a fastidious winemaker and a touch of a curmudgeon. Pollack is an experienced California winemaker, who with his wife, chose Virginia as his newest project. 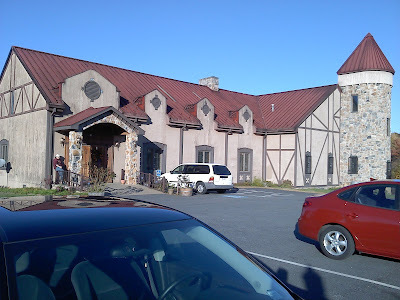 Linden Vineyards is located in Northern Virginia, in Warren County, in the town of Linden. The winery sits on a high mountain ridge surrounded by vineyards. They grow grapes at four different sites on the Blue Ridge. They are located on the Blue Ridge Mountains of Virginia only one hour from Washington D.C., but it seems like a million miles. They specialize in small lots of single vineyard Chardonnay, Sauvignon Blanc and red Bordeaux blends. Jim Law, winemaker and owner says, "We are respectful of the unique character and personality of each of our vineyard sites. " Law is a fastidious winemaker who keeps and publishes copious notes, and one also gets the hint he might be a bit of a wine-wise curmudgeon. Regardless, his attention to detail results in some incredible wines. 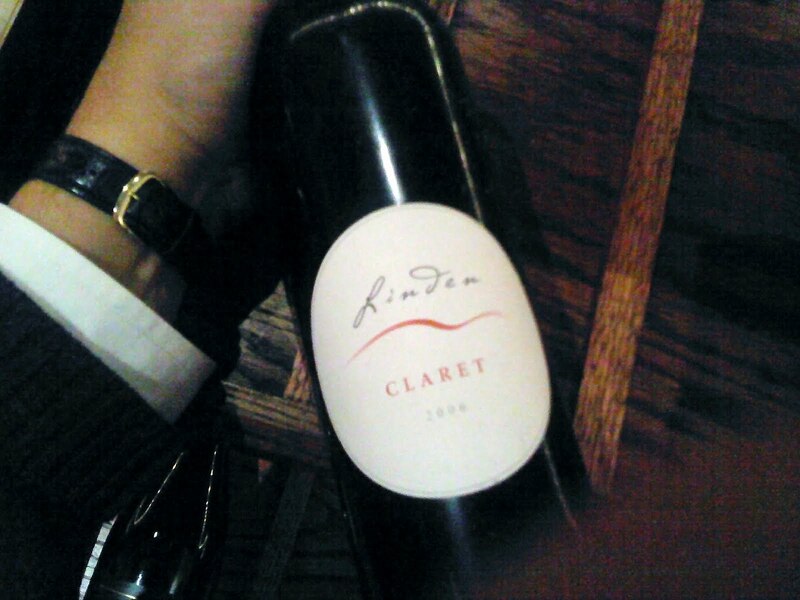 The Linden Claret 2008 is a blend of 38% Merlot, 31% Cabernet Sauvignon, 19% Cabernet Franc, and 12% Petit Verdot. 80% of the grapes come from Hardscrabble Vineyard in Farquier County, 10% from Avenius Vineyard in Warren County, and 10% from Boisseau Vineyard in Warren County. The wine was aged in older French, American, and Hungarian oak. They made 522 cases. The wine was an elegant, medium-bodied Bordeaux blend. It had lots of big red flavors up front like cherry, cassis, with hints of mocha and espresso. The wine has great acidity, deep fruit, nice tannins, and is extremely well balanced, and smooth. It was an excellent accompaniment to the meal. 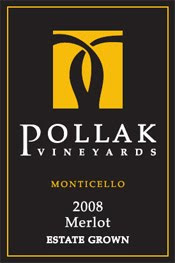 The next wine I had was a Pollack Vineyards Merlot 2008. Unlike Linden, Pollack is relatively new. Pollak Vineyards is a small family-owned winery founded in 2003 with the purchase of a 98-acre farm just west of Charlottesville, Virginia. Today they have 26 acres of French vinifera planted with the intent of making estate grown wine that has the finesse and balance of the traditional French varietals. Margo and David Pollack opened their doors to the public in 2008. Their wines have been an immediate success with critics and consumers. David is the winemaker. For David, this venture drew upon his experience in the late 1970s with vineyards along the Russian River in Sonoma and then his establishment of one of the first wineries in the now famous Carneros region of the Napa Valley. 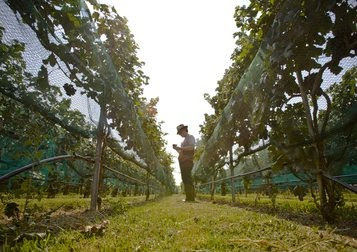 In Virginia, the Pollaks saw the potential to create great wines from well-sited and meticulously maintained vineyards. They sought the experience of other vintners and growers to seek an ideal site and then applied the best agricultural and winemaking practices. 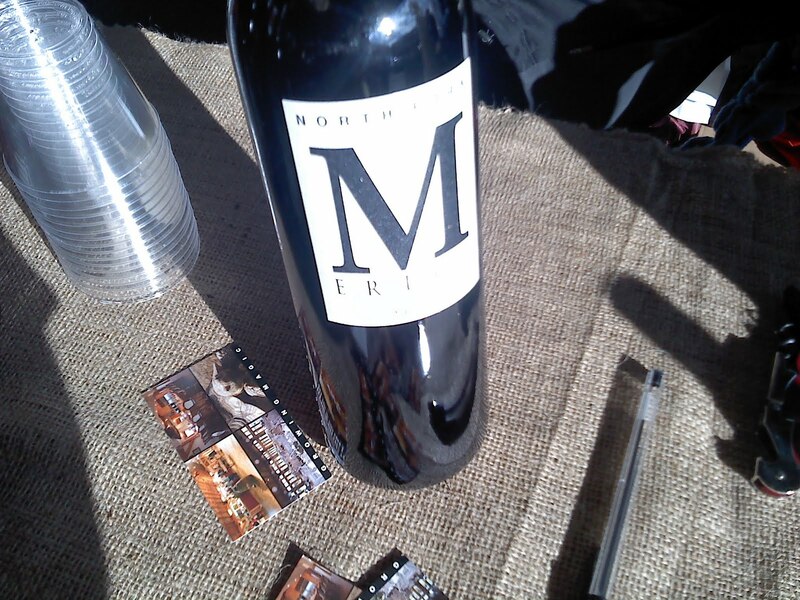 The 2008 Merlot comes from the original 10 acre block and the Smuggler vineyard. The grapes were harvested mid-September 2008, and were cold soaked before fermentation in micro lots and subjected to extended maceration, which results in the deep color and extraction of flavor and tannins. Cooperage was 45% new French oak and 55% used to neutral for 14 months. This medium-bodied, garnet colored wine delivers dark cherry and chocolate that come through as promised. But there are also hints of dark raspberries and a touch of dark plums, and a whiff of vanilla and some spices on the pallet. Great acidity. Nice tannins. A well balanced and fabulous wine. These were two gorgeous wines, with great fruit up front and beautiful finishes. Incredible reds. Wine lover and entrepreneur Dennis Horton began his wine making venture with a small home vineyard in Madison County, Virginia in 1983. It did not take him long to realize that, although the Virginia summers were warm enough to ripen almost any grape variety, the humid conditions favored growing grapes with thicker skins and loose clusters. In 1988, Dennis and longtime business partner Joan Bieda acquired 55 acres for the beginning of Horton Vineyards. The task of establishing the vineyard was given to Dennis' wife Sharon. Together, they have made history. While I traveled the Monticello Wine Trail, I made sure to stop at Horton, one of the most famous of Virginia's wineries. Most recently Dennis was featured in the very successful book, Wild Vines, the story of the Norton grape. The tasting room was large, bright, and airy. And filled with people. 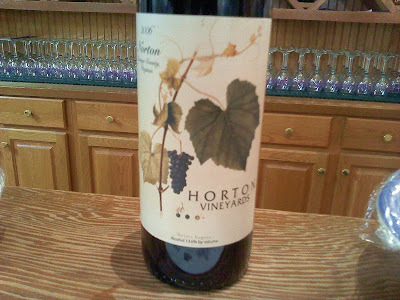 Horton Vineyards is proud to re-introduce the famous Norton wine, the original Virginia Claret. Norton is a native Virginia grape that produced the internationally prize winning clarets of the Monticello Wine Company of Charlottesville in the late 1800's. Horton's Norton has a dark, rich color. It also has a hugely intense, fruity aroma of plums and tart cherries. This spicy, aromatic red is aged in oak for 14 months. Absolutely a wine for game, sausage, spicy and robust stews, and grilled meats. Really something unique and different. Tannat is originally known for making big, tannic wines in the Madiran in southwest France. I cannot lie, I have not had the chance to enjoy one of these wines, so I cannot compare Norton's version to the original. 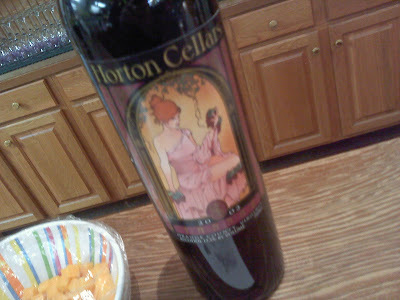 That said, Horton's Tannat a big, rich, full bodied, dry red wine. It's got big, deep fruits up front, with plums, prunes, and dark cherry, and hints of leather and spice. A lovely, lovely big deep red. Of course I am saving the best for last. Dionysus is made from Touriga Nacional, uually grown on the Iberian Penninsula. This has big deep fruit up front. As promised, the dried dark cherries, damson plums and mocha aromas some through, with whiff of vanilla and smoke. The deep red wine has a nice dry finnish, with some pop, but more a smooth, soft finish. Sometimes, when one is traveling, the wine tastes great in the tastingroom, but when opens a bottle at home, the wine seems lacking. With this, Dominique made large, thick pork chops smoothered in a spicey barbecue sauce, along with fresh cut green beans and Spanish yellow rice. The wine stood up to the spicy sauce beautifully, and for the fist time in a long time, we finished the entire bottle between us. Exquisite.